A trip to the Minnesota Renaissance Fair this weekend. We were with our daughter and her family. The 'boys' were interested in the side show events, the food and of course the jousting. I was busy watching the costumes! There were assorted grades of 'muslins' along with numerous brocades and velvets. When we are were reviewing our favorite parts (the little boys were all about the swords), my highpoint was watching the lady below gracefully mount her horse--side saddle!! I will be doing a presentation on Star Quilts at the Museum of the Rockies next Friday evening in conjunction with the Quilts on the Lawn show in Bozeman, MT. I began my research with the basic 8 pointed star and ended up captivated with the Lone Stars, especially those made by the Native Americans. The popularity of the Lone Star quilt pattern and statehood for Texas happened around the same time. (The Lone Star pattern was first seen around 1830, Texas joined the Union in 1845.) Early Lone Stars featured other smaller stars or Broderie Perse in the blank squares. The star and the circle have long been important images for many Native American tribes. Once trade beads were introduced to the fur trade in the early 17th century, classic stars were beaded on moccasins and bags. By the late 1880s the buffalo herds, so important to the Plains Indians, were gone. The Sioux and Assiniboine tribes along with others adopted the Lone Star quilt as a replacement for traditional buffalo robes. Now these quilts are used not only as tipi doors but also to wrap the dead, express joy at a birth, honor friends and loved ones, as altar cloths in churches, hangings for graduation ceremonies and a focal point of a 'giveaway'. I hope you can attend the presentation on Friday evening. 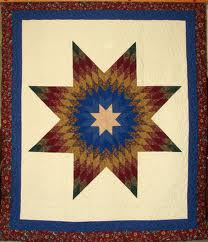 I will have numerous slides of Star quilts and a very special story about a Native American Giveaway featuring quilts! Crow for 'Laying Down Beads'. Friday I drove to White Sulphur Springs MT to listen to a presentation on Crow Traditional Women's Clothing by Mardell Plainfeather. She was fascinating--talking about growing up Crow, her mother's traditional dress and the clothing she has made for her family. These are pictures of a dress she made for dancing when she was 15. 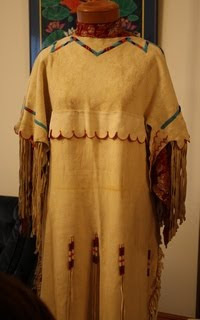 The beading at the neckline and on the sleeves lays down flat on the tanned deer hide dress. I would refer to the technique as couching. 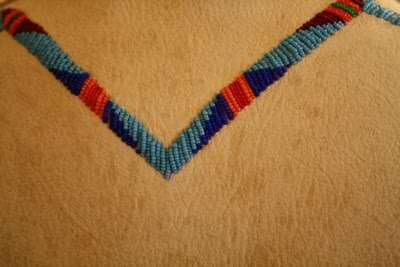 The beads that edge of the scallops, Bau loeclougua (Crow meaning Making Beads Stand Up), are coiled back on themselves and then tacked at the base of the loop to the deer hide. Donna Healy, staff writer for Montana's largest newspaper, come to visit me in June. I was the 'feature' for Saturday's edition. Donna has done a very comprehensive article about me and how I got started selling reproduction fabrics to the movie industry. I thought my readers might enjoy the story and the pictures. This link is good through Friday, August 6,2010.